Now when you are serious about keeping a proper planted tank there are two stages you need to think of and one often gets overlooked. 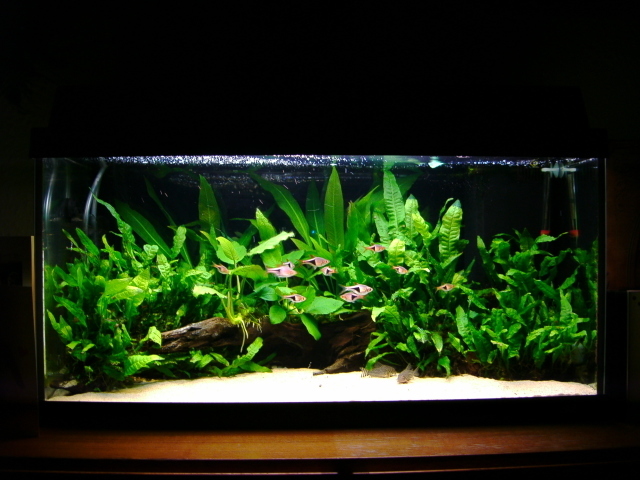 The first stage is deciding what you want, choosing a style you like, nature, dutch, jungle etc.. Then which plants you want to keep normally based on what looks good coupled with your tanks limitations in terms of light etc. Then you plant it up, fiddle about until it looks right then sit back and admire your creation. Unfortunately a week or two later your tank will look rather different. 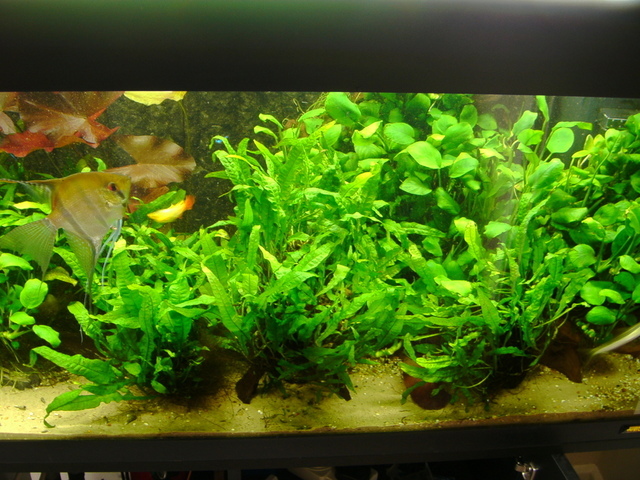 Some plants will have grown nicely, coloured up and spread into the perfect position Others however will have shot to the surface and spread across the tank to the front glass. Some leaved may have deteriorated or browned, algae will inevitably effect something etc. Now is the time to prune your tank. 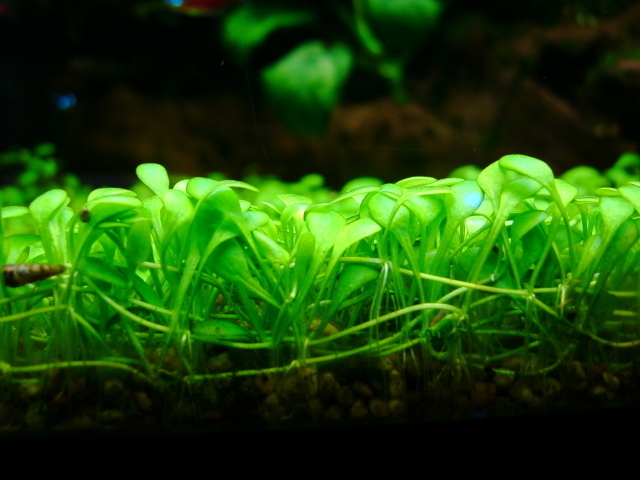 This is a simple process and if done correctly will not only instantly improve your overgrown aquascape but will encourage vigorous new growth improving the overall health of your plants. Not all plants are pruned in the same way so i have broken them down into generalised sections. When dealing with plants that have only one stem simply look at the plant while in the tank and picture where you want the top to be allowing for growing room between pruning sessions. 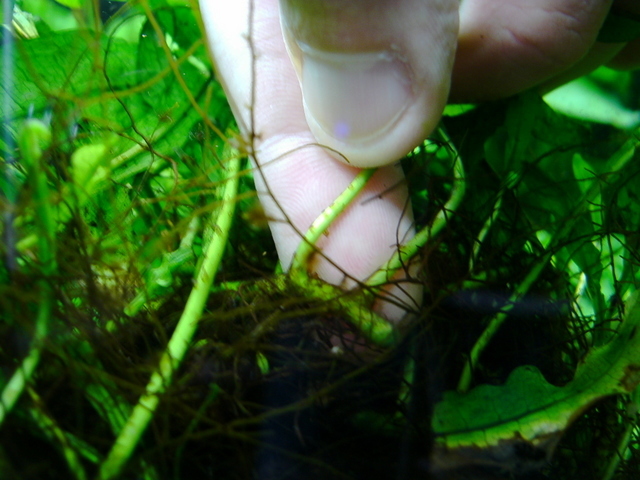 Then roughly measure the length from that point to the tip of the plant. Now uproot the plant and measure the same length from the base of the roots and cut through the stem with sharp scissors. Retain and replant the top section. 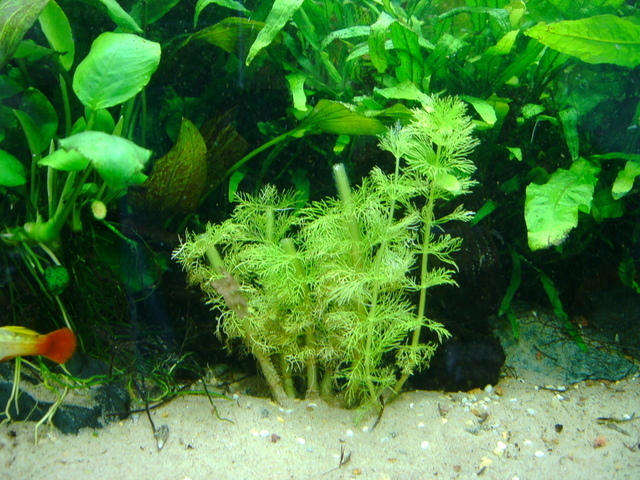 i usually plant three stems together with thin stemmed plants as it makes setting them in the substrate a bit easier. Try not to crush the stems when you push through the substrate, dig a hole with your finger and push the stems in the hole. normally the bottom portion will regrow albeit looking a bit ugly for a while. you can use these if you are trying to propagate additional stems for the main group. I am doing this now as you see below. If you want your stem plants to branch out and fill a larger area then snip off the very top section and new growth will be diverted to side shoots further down the main stem. This is useful when propagating Ludwigia etc. 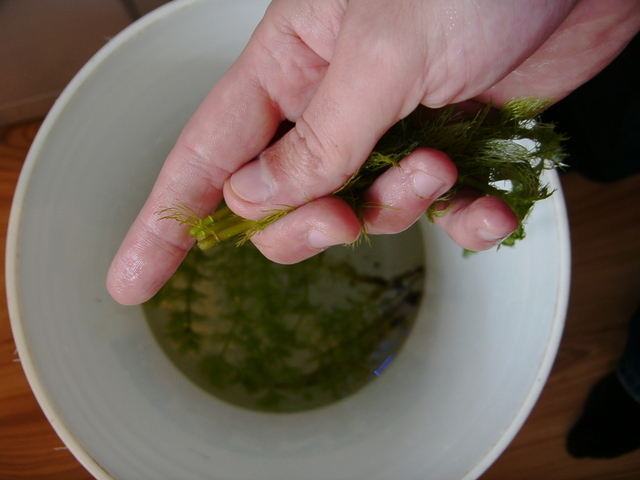 Stem Plants are the fastest growing of aquatic plants and will require regular weekly pruning to stay in check. These are steady growers, not quite as rapid as stem plants but do still require pruning. Sword Leaves should be removed when the leaf protrudes past the surface or if you see any damaged or dying leaves. To remove a leaf just slide your hand down the leaf stem to the crown and gently pull the leaf away from the crown. Do not snap the stem as this will rot and look unsightly. Try to push down on the crown with one finger whilst pulling the leaf with the other finger. You don't want to pull the whole plant from the substrate! 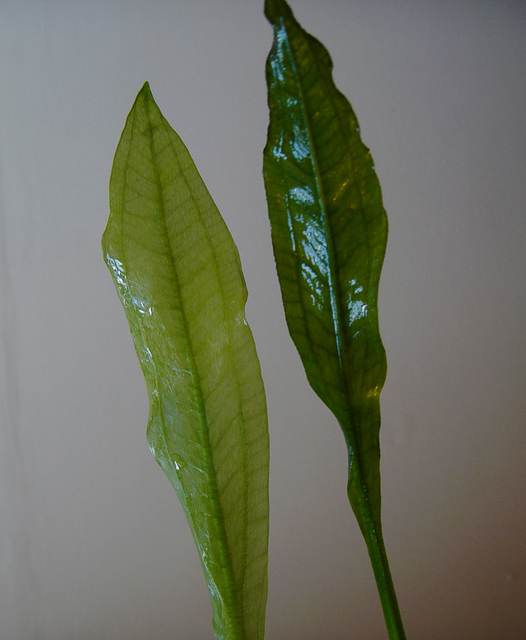 When you have removed the leaf you should see a white fleshy bit at the very base of the leaf stem. These plants are very good indicators of nutrient deficiencies. 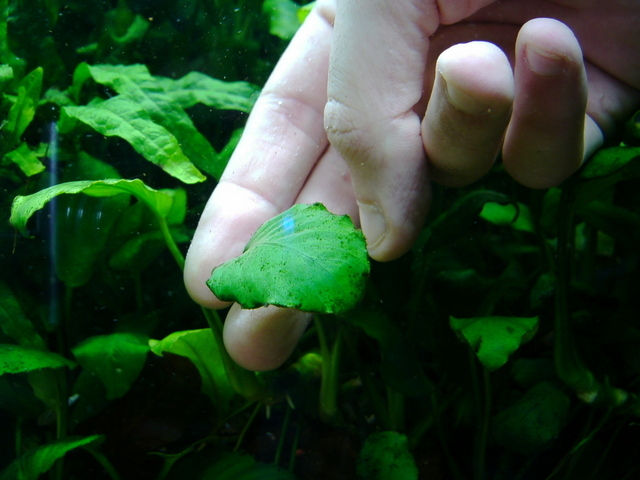 When you remove the leaf the following will tell you that you are not supplying enough nutrients to the tank. Should you need to completely remove and relocate a rosette Plant for any reason take the opportunity to wash the root ball and leaves in old tank water to get all the detritus build up out from the root ball and trim the roots down to 2 to 3 inches. This will encourage new root growth when replanted. It is worth mentioning that is a plant has a vast root structure it will therefore demand heavy root feeding for good health. If you do not have a substrate additive like flourite or laterite you way want to add fert sticks or root tabs below the roots before you replant. These species will greatly benefit from such products. These plants grow with a thick Horizontal stem called a rhizome and are usually attached to wood or rock. 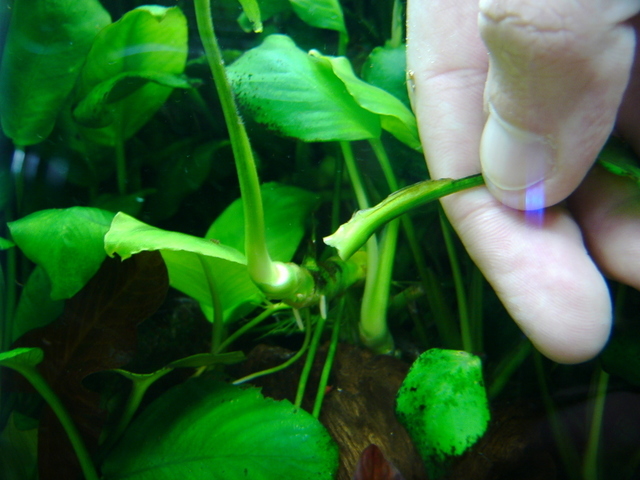 These plants especially anubias species are particularly prone to spot algae as they are among the slowest growing of aquatic plants. You can reduce this problem by shading with other plants but some leaf damage is inevitable. You will therefore need to remove leaves from time to time to maintain a clean look. With Java fern follow the leaf down to it's base on the rhizome. 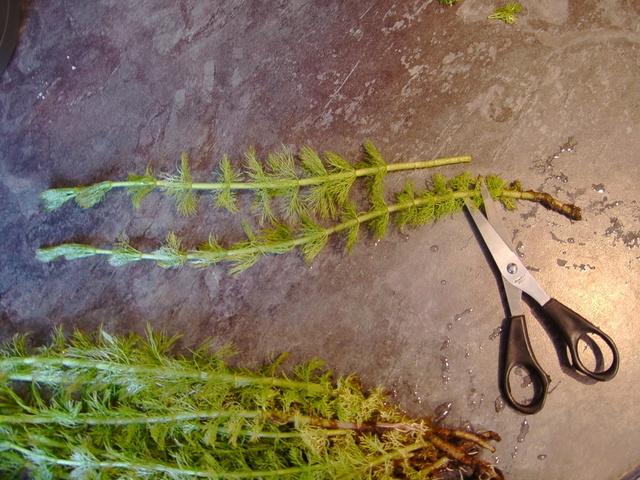 Then cut off with scissors (or if your lazy like me use your fingernail) as close to the rhizome as possible. 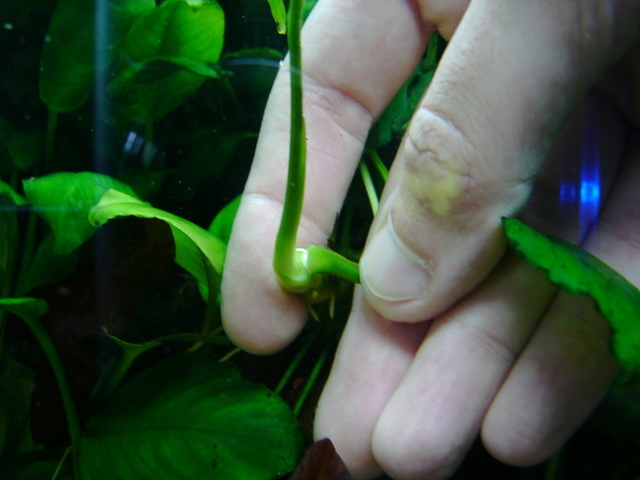 With Anubias do not use scissors. You will notice the leaves grow in one direction from the main stem. At the leaf base gently bend the leaf back on itself and it will pop free of the rhizome. As in rosette plants you will see a white fleshy bit at the base of the detached leaf. As these plants normally grow on movable objects i often remove the whole thing from the tank and wash it under the tap and get all the detritus out from deep within the plant leaves and root structure. The three specimens below are about 3 years old after planting initially with one inch plantlets from a mother plant. You can imagine the amount of detritus build up these collect over time in the core of the plant. i wash mine every month or so. 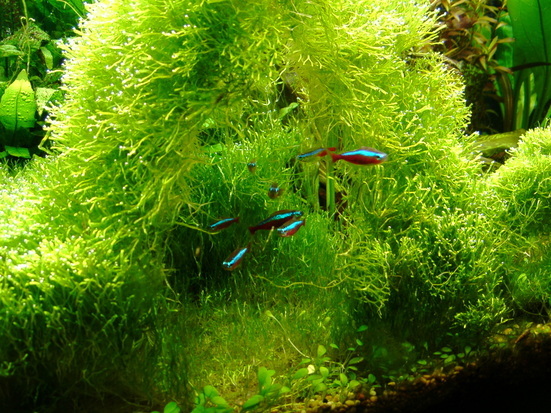 I often see posts with people worrying about vacuuming the substrate when you cant actually see it beneath the plants. This is not a problem as with healthy root growth the roots will slowly move the substrate reducing the chances of dead spots and stripping the substrate of potential pollutants before they build up. As far as cleaning is concerned just wave the gravel vac or syphon tube gently over the top of your carpet. 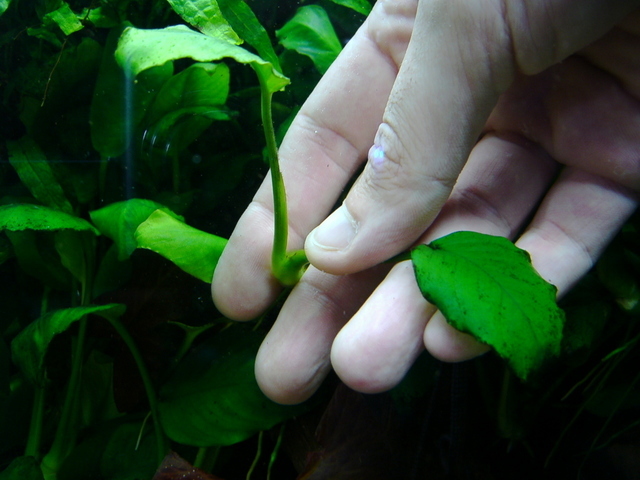 If you have any large messy fish any big poops will be sucked up, the rest beneath the leaves leave alone as this will naturally degrade quite quickly providing nutrients for the roots. Pruning a carpet is not really possible. You can contain it by snipping off stray strands but once it gets too dense it will begin to choke itself and need to be uprooted and replanted. On the positive side you will now have hundreds of plantlets to reseed your next carpet so it wont take very long to fill out again. The same is the case with Riccia. You can give it a haircut a few times but in time the new growth will cut out the light to the plantlets lower down the "cushion" causing them to rot and lose their grip on the netting holding it down. In my experience riccia covered slate etc.. has lasted up to 8 weeks before showing signs of falling apart. These plants are all connected together by horizontal runners at the base of the leaves, they have normal roots on each plantlet but pulling one can result in the whole chain following on so be wary of this when pruning. There is some debate over the pruning of vallis. I have often read that cutting mid leaf can result in brown tips followed by deterioration of the leaf. I have not had this problem myself and i do feel that as long as you use scarp scissors which don't crush the leaf then you can get away with it for a while. I always cut at a 45 degree angle so the cut leaf blends in with the uncut leaves next to it after pruning. You will however get to the point where it is taking over and needs thinning out. Remove whole plants by cutting the runners each side of the roots and removing whole plants. Depending on your foreground design you may or may not be able to access this. we have already covered gravel maintenance under carpeting plants above so i wont repeat myself. If you do have open gravel anywhere in the tank vacuum as usual but don't get too close to the roots of large plants or you may damage them with your prodding and poking. If like me you have an open sand foreground (ideal for corys and plecs) you can vacuum fully and indeed you should on a weekly basis. Sand compacts over time allowing no circulation of the substrate trapping toxic gasses in the process, if not disturbed these can build up and start to cause problems with plant and (more importantly) fish health. If you do not use a vacuum and opt for a syphon tube then use a tool (i use a chopstick) to stir the sand and release the gas. You will see bubbles when you do this accompanied by a slight smell of rotten eggs (Hydrogen sulphide) As long as this is minimal do not worry. Particular areas where this is most common is beneath rocks and wood so be sure to gently disturb the sand under them to minimise this. You will notice that the most stunning planted aquascapes you see in PFK and on the web all have perfect plants with seemingly no imperfections. I often thought their high budget setups and sheer skill with fertilisation and propagation were responsible for perfect plants, however the fact is that most of them are using the same equipment as you they just know how to get the most out of their plant collection through care and attention. The good news is everyone can do it, you included.